Remember the old data science T-shirt? Measurement is always important, especially for brands, without it you can’t measure return on investment. A lot of marketing campaigns are like that, just throw it out there and hope that someone clicks on the link or at least looks at the landing page. If you’re using an email system like MailChimp then you can see a lot of metrics on opens, bounces and so on. From what I’ve witnessed and thought about this year, influencers don’t seem to be able to measure and this got me thinking. The path to measurement is not straightforward as one might hope. Thinking of the main platforms of use: Instagram, YouTube, SnapChat and Facebook – each have their own way of doing things. What these mainly measure are views, okay as a starting point but ultimately a pointless measure. “So my picture of your hotel was seen by 2,576 people.”, so what? With Instagram you can’t embed links in the posts. You can add a link but the reader will have to copy/paste or type it in themselves. So any form of tracking at that point is out of the window. I know, I tried. You can though add the username of the sponsoring account but how on earth do you measure that, well you don’t. A number of companies have tried the whole embedding links on YouTube video, Taggled.tv from Belfast had a good shot at it and gained some traction, sadly it seems to be no more. With YouTube there is at least a decent description block to put all your links in….. watch YouTube on a PS4 console for example and all the decent info is lost or just plain hard to get to. Louis Cole, better known as FunForLouis is a traveller, vlogger and seems to be a nice guy (never met him but I do watch his stuff). He does a lot of sponsored stuff for various brands like Nokia, Google and tourism departments. The videos are nice and with a small group of friends/influencers has his own boutique influencer consultancy Live The Adventure Club. Looking at his last video I’ve made a couple of observations, keeping in mind this is just a first pass. I’m not going knock Louis, that’s not what I’m doing I’m just using the video as an example. Brands will always want to know what the reach is. Louis has 2 million subscribers who get some sort of notification when a new video goes up. The real metric though is the actual views or an average of the views over the last twenty videos. Which I’m estimating to be about in the 45k area which is 2.25% of Louis’ subscriber base. Is that something to be worried about? I have no idea, these are merely observations, my biased opinion would think it’s a red flag but brands go with Louis as he has a reputation and that counts for a lot online so I totally get why a brand would go with him, he’s a safe pair of hands. Here it is, the YouTube description. Let’s look at Louis’ video again. There’s a lot of real estate here and it’s being used. There’s 18 lines of text here (and a lot more underneath). One is used for the sponsor and, for me the ultimate marketing sin, there’s no link back to the sponsor. Is there a reason why? Is there something I’m not seeing? It’s not like there can’t be affiliate links as Louis has links to all the computer and camera gear he’s using with Amazon partner links to purchase which give a kickback in the form of cold hard cash. So it’s not like it can’t be done, it just hasn’t been done. As a sponsor that’s exactly what I’d want to be measured. So the question is, how? Oh yes we do. And I’m going to go back to my influencer/hotel model here because it’s been the one I’ve been thinking about the most, especially when influencers promise all sorts without any form of reference or reputation. Remember brands, anyone can buy 10,000 users for very little money. And to some folk perception is everything, “I’ve got 100k fans!”. That’s fine but it shouldn’t happen for free. Right now this is just bartering with no negotiation. And the job comes in the haggling. It’s all about ceilings and floors. How about the hotel does a 25% discount and along with it a custom link. For every successful booking that comes through that link we’ll deduct 5% of the booked amount from your account. If you get a lot of bookings via your videos then you’ll start making money. For example: The Eden Andalou Aquapark and Spa is currently £1852 for the Executive Suite per person. If the 25% influencer discount was applied it would be £1389. Every successful linked booking (it has to come from the video otherwise you can’t track it) would deduct £92.60 from the influencer’s balance. Fifteen bookings via the video would clear the balance and then after that the influencer would be in profit. Personally I think it’s important that influencers can think this way. This is what brands will want to see going forward, this kind of thinking. The issue will always be traceability. It’s a numbers game, it always has been and it always will be. Brands want to de-risk, it’s as simple as that. Anyone can be an influencer and with so many influencers in the eco-system it’s it’s really difficult for any brand to figure out who’s going to be best for the brand. So, there has to be sacrifice on both sides. A hotel doesn’t want to lose money and an influencer doesn’t want to lose out on a decent place to stay. (I’ve yet to see an influencer do a sponsored video for Premier Inn or Travelodge). I think fashion is different, cost of production of dresses is vastly different, easier to ship and it’s just eyeballs at that point, like most fashion advertising, it’s just a sunk cost. If this concept could be used, I’d be on the phone to Zara by the end of the day. What I’ve outlined is hardly new, it’s affiliate marketing mechanics with measurement on both sides. I’ve just added it to my list of things to build….. The real challenge is the platforms themselves, I’ve proved out that YouTube is workable, I’m assuming that Facebook posts would be the same. It’s when you get to the mobile platforms that measurement gets tricky. And that’s where the work needs to happen. Any thoughts? Pop a comment below. It’s been an interesting weekend for my field of work. Especially in an industry where I do stuff with data…. Which is basically the worst kept secret in technology companies, entrepreneurs and tech “thought leaders”. The value is in the data and once you figure out how to monetise that then a free product to customers is no bad thing. Anyone who knows me knows my love of customer loyalty data, I’ve worked with it since 2002, mined Nectar card data and came up with recommendations via vouchers and offers on how to get customers to change behavior. The Cambridge Analytica approach is far from new it’s just the domain it was applied to. Once you know you can change another persons behavior there comes a sense of responsibility with it. As the custodians of the data you now have the power the change the course of another person’s future without their knowledge. That thought alone is scary as I know some that would exploit it for profit like squeezing a grape until no more juice would come out. So think about it all, every card, whether it’s loyalty cards, bank cards, your medical records on the GP’s system. Do the likes of Tesco/Dunn Humby have a public list of where their Clubcard data is sold? Probably not. I asked a question during a Big Data Week panel in 2015, “Who has a Clubcard?”, pretty much all the room, “Who wouldn’t mind if your shopping habits were passed on to the insurance company?”, all hands with the exception of two went down very quick. Telephone call logs are another and the classic line, “we may record your call for training purposes”, training what exactly? Another customer representative or an machine learning or AI tool to decide whether to keep your custom. How do we know, well we never do because we never find out. Will the events of the weekend turn the tide against Facebook, it’s 50/50. I mean 50m users of Facebook is only about 2.5% of the user base and most hardened cat/dog/baby picture posting users won’t care. If I were to bet, I’d said probably nothing much will happen. The only people who need to change are you and me, about what data goes were, how it will be used and how to have it deleted when we’re done with that service. A short post but an important one. It’s one of the most interesting plays I’ve seen to push a time critical offer. And it’s an interesting one to break down a little bit. So, in the great Gary Vaynerchuk tradition let’s get micro on this a little bit. So to push a two hour conference here’s the deal, you buy two cases of wine, selected by Gary, for $479.99. There’s no “buy tickets to this event”, no GetInvited or EventBrite links to buy access (and giving another supplier revenue). It’s a simple buy this and you’ll get what Gary is offering, a place at the conference. An item, could be an appointment, a session or a stock item. In this case it’s wine. A payoff: money off, free gift or access to something scarce. Here it’s Gary’s time. A time limit. Here’s it’s the day of the conference, October 14th. Assume that with the audience size (see on the image it’s viewed over 206,000 times) that the offer will sell out beforehand. Scarcity accelerates demand. A clear outline of the overheads involved, more on this in a minute. Not a lot to it really…..
Not bad going. A call to action and incremental revenue. Perfect. At a guess there’s a clear 30% profit margin once you take off sales tax, salaries but there’s no room hire or, I’m assuming, paying Gary to active for two hours (and the rest). Overhead reduction means profit increase. The scene is simple really: know your audience, know your stock and know your numbers. The time frame it critical, there are customers who want your product and don’t want to lose out. Find them by the medium that they consume (Snapchat, Instagram, Facebook and Twitter etc) and deliver the message. If you can personalise it then even better, that takes effort though. In my opinion Gary executed it perfectly, the results though will be in the point of sale. That’s the measure. The SmartRetail Conference is taking place on Thursday 28th in the Culloden, Belfast. I was asked to talk about customer loyalty and my experiences with loyalty based discounting, something I covered with uVoucher. So, day off booked. Slides are done. And yes, I will talk Tesco Clubcard and the supply chain wonders of the Zara fashion chain. It’s all about the data. This is a great opportunity for anyone in retail to network and learn some new things. You can pick up tickets on the SmartRetail website. Loyalty is really about customer control. It’s about crafting, controlling and defining the conversation. The most control of customer loyalty the customer actually has is by leaving and going to another brand. Loyalty plus Currency is about controlling the customer conversation, not just about whether you can interact in certain ways with the brand but with the addition of how the customer can buy with you, that’s where there’s power. In the last few days Taylor Swift has come under fire from some quarters about rewarding loyal fans with access to tickets to concerts. Plain and simple to put the tickets into the hands of fans, not the ticket touts or bots. The first stage of loyalty, measure the feedback from the customer. Rewards are based on interaction with the brand. With no way of measuring the conversation (whether that’s by a loyalty card at the point of sale, social media or coupons doesn’t really matter, what matters is that it’s traceable and measurable). I think the criticism from the media and other bands is too harsh, I see where the angle is in all of this. If customers get annoyed with the brand (Taylor Swift) when it’s outside of the brand’s control, in this case touts and bots, then it harms the brand and causes long term value damage between the customer and the brand. The partnership with Ticketmaster changes that, the vendor does the monitoring and it’s case of tying up the customer to the loyalty (social media) and a determining factor on whether that customer is loyal or not. If the scoring is good then you can book a ticket, if not then you move down the priority queue. Basically if you can show loyalty to the brand, the brand will be loyal back. It’s not perfect but it’s an improvement. There is nothing new here. It’s just that it’s Taylor Swift so it’ll come under the media microscope. Personally, I think it’s a perfect move under the circumstances. Any artist wants to perform to true fans of their work, not those merely entitled by the size of their wallets. In days gone by counterfeit concert tickets were easy got. I never knew they existed until I went to see my first proper gig in 1986 when I saw Level 42 at the Manchester Apollo (Mike Lindup lost his voice that night but it left it’s mark that I’m still a musician thirty years later). So, these touts were hanging around the front doors selling dodgy tickets, no one bats an eyelid. Some chance it…. I have my ticket and I’m not letting go of it. How touts operate now in the internet age, buying up loads of tickets and selling them at crazy markup. Bots make the whole process worse by purchasing at far faster speeds than any human can. The fans lose out, the artist isn’t happy. The issue is that the currency is the same over whether you’re a tout or the most devoted fan of an artist. It’s sterling, or the US Dollar or whatever you’re paying in. Brands don’t control the global currency markets. Firstly you need to control the ticket creation, verification and authenticity of the tickets for a concert. Dare I say it, I think blockchain might be the answer. The ledger would act as a historic and signed list of tickets generated. On concert day and you get your ticket scanned the confirmation system would lookup on the ledger for confirmed blockchain keys, if you’ve got a confirmed key then all’s good. If it’s a bad match and there’s nothing in the chain, well it certainly wasn’t generated in this ticket run for this gig, back to the car park with you. If you keep the blockchain ledger locally (ie within the venue on concert day) then you’re reducing the round trip from scan to confirmation. I’ve worked with mobile scanning ticket confirmation systems that work over the air to internet servers, they’re slow and connections break frequently. Local servers, reduce complexity and increase speed. So where do Taylor and a Whopper collide? If you can control the loyalty and who gets what, whether it’s a supermarket like Walmart or Tesco or a global artist like Taylor Swift, that’s one thing. To control what the customer buys with is something else. Interestingly Burger King in Russia are tying up the customer loyalty from the opposite side, the currency. They’re trailing a WhopperCoin which is a Bitcoin/Etherium like token. These tokens can be bought, sold and traded like bitcoins and can exchange between the brand (Burger King), any of BK’s partners and even better customers can sell currency between themselves. It has value. Loyalty card points have value but it’s usually fractional and in some places come under banking and finance rules. If you’re running your own loyalty scheme with points it might be worth checking…. you’re effectively introducing liquidity into a market. So, WhopperCoin for currency with limited use to loyal customers. And a ledger based control system for ticket/transaction authenticity. Taylor Swift merges with Burger King, kind of…. Not literally but the concepts could. What if we’re to say that Taylor Swift fans can earn fractions of TaylorCoins for social media support, blog posts, full youtube views of videos and so on. These coins can be sent, received and traded between each other and also used to buy blockchain enabled concert tickets. At this point, as I see it, if a tout or a bot wants to purchase Taylor’s tickets for a show they have to be in TaylorCoins and anyone converting huge amounts of dollars into TaylorCoins would send off alarms in the system. When the brand has control of anomaly detection at this scale it means the brand can act by either declining the transaction or other means. The tout at this point will stick out like a big red flag in a very strong wind. When you control the currency, you control the brand. Touts can be turned away and early in the process. At this point the only way to create tickets would be to create fake ones. And as they are in the blockchain they are easily authenticated against all the other tickets in the ledger. Tours usually break even, unless you’re the Rolling Stones. And that’s why the artist/tout relationship has never been good and it never will be. One side is gaining huge volumes of money over the artist’s reputation and brand. I’m skimming the surface of a bigger idea here I think but on paper the artist controlling the ticket ledger with blockchain and also controlling the currency of how a customer interacts with the artist provides two key steps to reducing the possibility of fraud, counterfeit goods and preventing real fans from getting access to their idols. Win, win, win and win all around. Give it five to fifteen years….. everyone will be going to concerts this way. Perhaps. Are chatbots the beginning of the new internet? No, I don’t believe so, it’s just another realignment of how users interact with the internet. “The new websites” is something I don’t buy into, a chatbot is just another black box dependent on an input stream of information from a user. Let me explain…. Like our own input devices; eyes, ears, nose, skin etc the internet has worked within a set of input devices of its own. Web forms, SMS messages (and WhatsApp, iMessage, Kik etc), voice recognition, Slack channels and so on. In common though is there is information fed through these channels that has to be handled, interpreted and in some cases responded to. The early days were pretty basic call and response stuff. And chatbots of one type or another have been around for a long time. Who remembers writing bots for IRC and AIM Messenger back in the day, just me…. I don’t think so. Slack offers the addition of a signed up audience, you’ve already registered an interest to join the channel so that’s a lot of work done already. Especially if you are interacting with a brand, the rest is a matter of reading the input. To be fair brands should be doing this with all the input channels they have, web forms, email, slack and Twitter etc. And in most cases it can be automated. The important part of all of this is the black box which is decoding and defining the response. “Hi, my name is Jason and I’d like to book a restaurant table in Belfast please on 1st July”. There’s an action (a user wants to book something), a type (in this case a restaurant) a date (1st July) and a location. The type could be interchangeable at this point, it could be a hair appointment or a flight booking. All we need is an AI that can handle all this things coming in. At this point we know the phone number, email address or slack name of the user so we don’t need to go finding that, we’ve already got it. I’m using the Clojure OpenNLP and the NLP models to tokenize and extract the details that I’m looking for. And for ease I’ll do it all from the REPL. First thing I have at my disposal is some predefined models that have been trained. So for things like names and location I’m not having to do lots of work. Let’s define our input text, we’d normally be reading this from an API of some form or via email reading which can be easily automated. With my models loaded and my input text defined we can have a go at extracting some information. Even with that information alone we can form a response and say “we’re on it” and send that back to the user. Keep in mind the response mechanism is only another API to the input sensor provider (email, Slack, SMS etc). In other words it can be easily handled programatically. ;; => Hi Jason - looking for restaurants in Belfast. Remember that OpenNLP is returning sequences of words that are in the model. At this point we could fire off an API call to Yelp or Open Table and look for restaurants in that location with the resulting first ten results being sent back to the user with TripAdvisor reviews. This is the surface scratched. Chat bots as they currently stand are an easy technology. Input data from an API going into do some decoding model and a response being generated. The challenge is to have a meaningful conversation, do I hear Turing Test anyone? So the question remains, why Slack as an input medium. Well it’s an easy route to knowing who the customer is in the first instance. Plus the UI is built, the API is defined and it’s easy to integrate to. If you’re looking for the real holy grail, you want to raise the UI to the next level and start looking at speech as the input sensor. And that means waiting for Apple to release a Siri API (developers have been waiting a long time for that) and Google to release the Now API. I’ll be tinkering with this a little more in the future. My fascination with loyalty goes way back, I’ve pushed and prodded the corners of this area and it’s enabled me to learn and eventually work in some very cool areas such as mobile and, more importantly to me, data science and engineering. So I always keep an eye on things as you never know when opportunity will present itself. Over the weekend yet again I was thinking about airport retail and mobile loyalty and I glanced over the editorial press releases in Airports Magazine (yes there is a magazine for airports) and I read a press release from Eye Airports partnering with Proxama to deploy 200 iBeacons in 8 UK airports. Is This How Passengers Want to Be Treated? I’ve done a lot of flying this year so I’ve spent a stupid amount of time sat in departure lounges. So plenty of time to observe. There are three issues with iBeacons that always have bugged me. What’s the battery drain impact? Ultimately the iBeacon is an Apple creation, while the underlying technology isn’t anything more than Bluetooth 4 scanning for phones and devices Apple are going to greater lengths to cut out other vendors. So much so that Google are developing their own for Android. Now no retail space wants to start keeping two beacon devices just to keep two vendors happy. If there’s anything I’ve noticed recently there are a lot of Android devices being used by travellers. Air travel is stressful, the main aim is to get through security relatively unscathed. 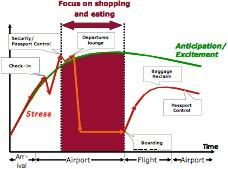 Once you’re through then stress levels drop while you enter the retail space known as the departure lounge. Even when you board your flight the stress level is far lower than getting through security. A new element in the mix is that of device battery life. With the era of electronic boarding cards preserving battery life is now a clean cut fly/can’t fly decision. Unless you can find a charging point (Newcastle does this well, Leeds Bradford I struggled a bit and Belfast International has one table at Starbucks holds plug point nirvana) then you will do everything to preserve battery, first things first is turning Bluetooth off. Once this happens then every marketing play by beacons is redundant. You always need a Plan B for how you’re going to reach a customer. Privacy will always be in the back of people’s minds when it comes to this form of technology. There’s a pseudo opt-in mechanism, you’ll need some app developed by Proxama for example in order to be picked up by the beacons. But every push and pull will be recorded so the data that can be gleaned is going to be retail gold dust to those that can analyse it. And recently customers are turning away from deals, daily deals and being force fed “buy this”. There are a couple of instances where I’d want to be forced ads but that’s from an operational standpoint where certain events could happen. Eye Airports and Proxama are on a two year contract to roll this out and see how it performs. I’ve got reservations of the amount of passengers that will actually use the technology just based on the basic logic of how passengers behave in airports with mobile technology, the technology stack itself and whether passengers want to be creeped out by being tracked. I’ll never get to see the final metrics I’m sure, but I think it will make interesting reading to those who can.